The following fish will be included in our shares on a rotating schedule as they become available. Acadian Redfish is a low cholesterol fish, also known as Atlantic or Ocean Perch. It is a lean, white, moist and flaky fish known to have a distinct and sweet taste and a firm texture. Redfish is becoming very popular among many high end restaurants in New England due to its versatility and its ability to be served whole. It is a very popular fish for fish tacos. Most fishermen you talk to say redfish may be their favorite fish in the ocean! Haddock is one of New England's more commonly known fish. A cousin to the cod, haddock's meat is white, with a slightly sweet taste and a flaky consistency. The flesh is firm and tender and can be cooked in a variety of ways, including in soups and chowders. And luck for us, the Haddock quota has increased for NH Fishermen this year! Pollock is a beautiful fish with a firm texture and low oil content. Because Pollock yields such a high quality fillet, it is often miss-labeled as Haddock--especially in fish sticks and fish and chips. It is also very popular by the fast food industry. Don't let that fool you though--when fresh off the boat, its taste and texture rival any fish in the sea. It is exceptionally great for frying because of its firm flaky texture. Its one of our personal favorites, and it just might become your favorites too. Gulf of Maine cod is not nearly as abundant in our waters as it once was in the past. Stocks are in the process of rebuilding and regional catch quotas are at an all time low. Once, one of the most fabled fish in the sea, the discovery of cod off the coast of New England changed the way the world developed. Cod has a uniquely long shelf life and perfect mild taste that makes it extremely commercially important. This fish can be prepared a great number of ways, like our other white flakey fish. Winter flounder or "blackbacks", got their name because of their migrations-in winter, adults migrate from offshore areas where they feed to inshore areas like bays and estuaries, where they spawn. Winter flounder has a sweet taste and firm texture and is often the standard to which other flounder species are compared. Winter flounder absorbs seasoning and marinades readily and cooks up great on the grill. Also known as American Plaice, Dabs are a low-calorie flat fish high in protein, which can be prepared a number of ways. When cooked, Dabs are a lean, boneless, flaky white meat that is considered mild in flavor. Yellowtail Flounder is one of the most popular of North Atlantic Flounders. Like most flounders it is a lean boneless white fish, with a mildly sweet taste and firm texture. It is delicious pan fried, or simply broiled with a little lemon, olive oil, salt and pepper! Sometimes referred to as the little cousin to Atlantic cod, White Hake has a slender fillet with a mild flavor and soft texture. When fresh, the meat has an off-white color that turns white when cooked. They are lean fish and are often compared to cod, but are known to have a softer texture and can be prepared in any number of ways: baked, poached, steamed or fried. It is a versatile fish for anyone who likes a lean white fish. Monkfish are primarily harvested for their tail meat. The tail meat is firm in texture with a mildly sweet taste. The meat is not flaky and is most often compared to that of lobster and scallop,hence the nickname "Poor Man's Lobster". Delicious! The thick meaty fillet holds up great on the grill as well as in the frying pan. A classic favorite is to wrap the fillet in bacon and bake it, but then again, what isn't good wrapped in bacon? 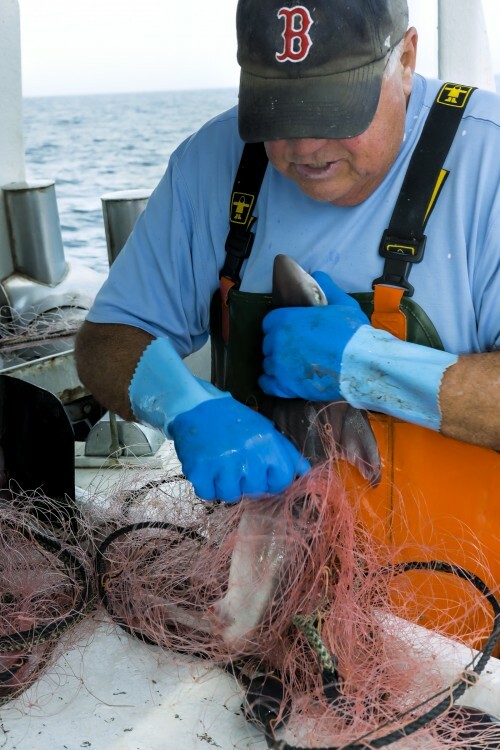 Dogfish are a family of shark that are beyond plentiful off our coast and offer a great variety to our CSF offerings. They are most commonly shipped to Europe for England's infamous fish and chips and therefore vastly unseen in local fish markets. Because they are a shark, dogfish have a meatier, white fillet and hold up great when fried, baked, or in a chowder. Restaurants that serve it around town, suggest soaking it in milk for a minimum of 15 minutes before preparing it to help tenderize the meat. Dogfish also holds up really well on the grill and takes a marinade nicely. The possibilities are endless with this ocean floor predator. Whiting, also known as Silver hake, have softer flesh and are less flaky than other whitefish such as cod, haddock, and pollock. Hake tastes mild and slightly sweet. The raw flesh is white to off-white, with a coarse, watery appearance; when cooked it ranges from pure white to off-white. Hake can be substituted for many dishes calling for pollock or cod. Silver hake, which is firmer in texture than many other hakes, is popular as corned hake in New England.